Men's basketball players walk out on the floor during a game against VCU Saturday. With 12 minutes left to play at the Siegel Center in Richmond, Va. Saturday, VCU scored consecutive buckets within 30 seconds against men’s basketball. The points pushed the Rams lead to 11 points – the first double-digit score differential of the game – and energized the crowd. Earlier in the game, GW countered VCU’s streaks and kept the contest within striking distance. But during the last 10 minutes, the Rams took over and sealed the win – sinking eight more second half baskets than the Colonials. 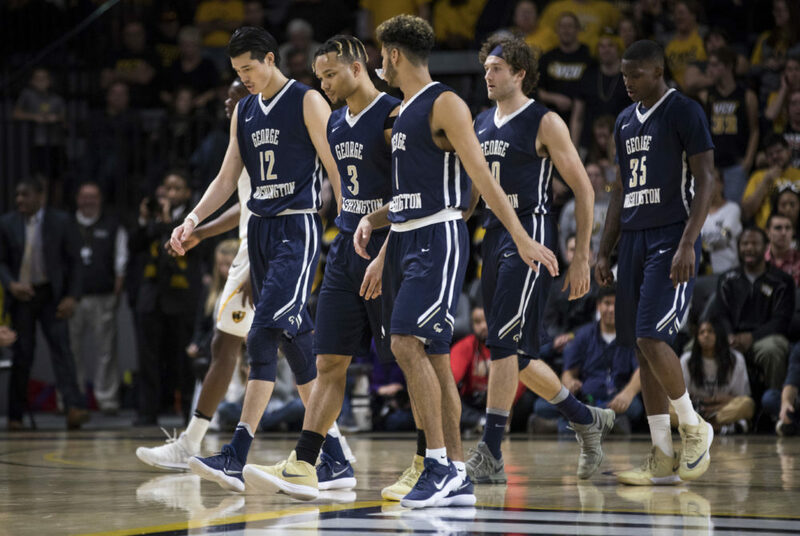 The Colonials (9-11, 2-5 A-10) dropped its fifth game in six matchups and lost to VCU (12-8, 4-3 A-10) 87–63, despite shooting 70.0 percent from the field in the first half. The Colonials were led in scoring by senior guard Yuta Watanabe, with 19 points on 7-of-13 shooting, and freshman guard Terry Nolan Jr., with 15 points on a 5-for-7 clip. GW’s few good offensive performances were overshadowed by the team’s inability to hold onto the ball on the offensive end. The Colonials committed 16 turnovers, including several that helped VCU build its runs. Senior guard Yuta Watanabe goes up for a layup during a men’s basketball game against VCU Saturday. On the defensive side, GW allowed the Rams to control the paint in the second half and control the boards. VCU turned 12 offensive boards into 18 second chance points – limiting the Colonials from capitalizing on missed shots. Commanding the Rams’ inside presence throughout the game was senior forward Justin Tillman. He finished with 18 points and eight rebounds and challenged GW’s big men from staying in front of him without fouling. Joseph made only his second starting lineup change of the season, putting sophomore Arnaldo Toro and graduate student Bo Zeigler in as forwards with graduate student Patrick Steeves coming off the bench. The alteration was due, in large part, to Tillman’s physical dominance and the need for strong interior defenders against VCU, Joseph said. The Rams shot 55.2 percent as a team, including a 61.5 percent first-half clip, and 18 more points in the paint than GW. They are the fifth consecutive team to shoot more than 50 percent against the Colonials. VCU started the game off with a 5–0 lead, but Nolan and Zeigler helped GW remain not far behind during the opening few minutes. After basket trading kept the difference around one possession until the eighth minute, a five-point run from Watanabe alone – including an open three-pointer – tied the game at 18. A 7-0 run featuring three layups helped VCU take a sizable jump ahead on the scoreboard, but responses from Toro and Steeves quickly turned the game back to one possession. Watanabe tied the game again with another shot from behind the arc with four minutes before the half – frustrating a Rams team that said they were working on contesting perimeter opportunities. Although VCU went scoreless in the final 3:23 of the first, the Colonials went into the break trailing 41–37. In the second half, GW’s momentum fell off completely. After allowing a 5-0 run in the opening 1:09 and watching the Rams take a double-digit advantage, the Colonials shooting touch disappeared. 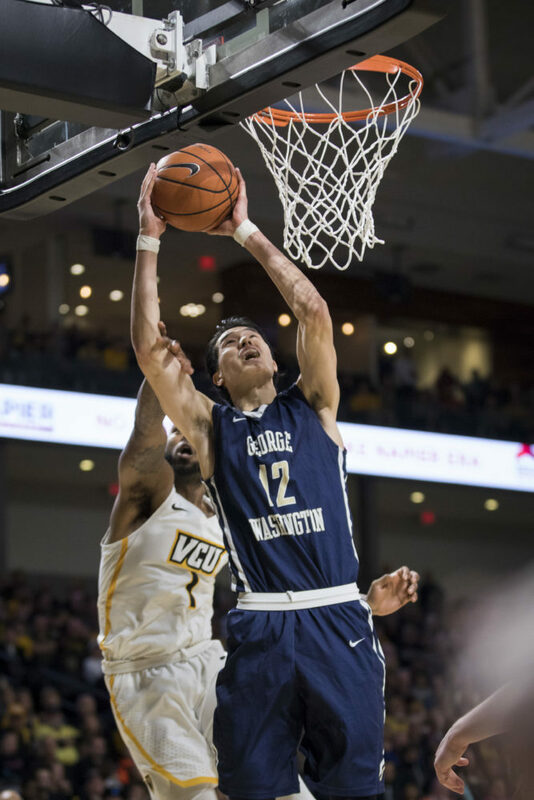 GW went just 8-for-29 from the field in the second half and 2-for-11 from three-point range – allowing VCU to take control of the glass and command the pace of play. The Rams used a spread out second-half attack to slowly increase their lead – going on three runs 6-0 or better in the final nine minutes. GW trailed by as many as 27 points before connecting on a buzzer beating heave by Nolan. The Colonials return to action at St. Bonaventure (12-6, 2-4 A-10) next Sunday. Tip-off is scheduled for noon.